The Nigerian troops under the 1 Division of the Nigeria Army have killed no fewer than 10 bandits and suspected terrorists in various joint operations tagged “Operation Restore Peace II” in the Northwest zone of the country. 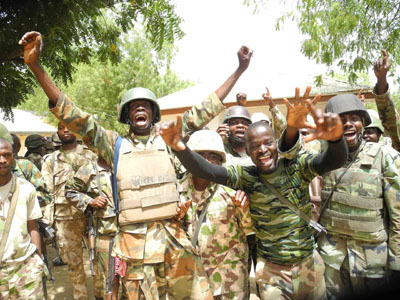 During the military operations about 64 suspected terrorists and bandits have also been arrested and handed over to the Police for further investigations and prosecution while 7119 cattles, sheep and goats were also recovered from rustlers and bandits who have been terrorising people from the zone. The zone comprises of Jigawa, Katsina, Zamfara, Sokoto, Kebbi, Kaduna, and Kano, while the operations extended to Niger and Kogi states in the north-central. According to a statement issued by the Deputy Director, Army Public Relations of the 1 Division Headquaters in Kaduna, Colonel Usman Abdul, the operations were carried out by combined team of Nigeria Army, Nigeria Air Force, Police, DSS and Customs personnel among others. Colonel Abdul said: “in Kaduna state and its immediate environs, the expanded security outfit involved in the operation have made recovery of 2081 animals like cattles, sheep and goats. 27 suspects were arrested and lots of weapons of different calibers were recovered from the bandits. “In the axis of Sokoto, Zamfara, and Kebbi states over 3027 animals which included cattles, goats and shhep were recovered. 33 suspected bandits were arrested with 11 weapons seized in the course of the operation. All the suspects were handed over to Zamfara DSS and the Police Command while the animals were handed over to Zamfara state government officials. “In the area covering Kano, Katsina and Jigawa states , the joint operation recovered a total of 2011 animals, 4 suspects arrested and 10 bandits were killed during encounters and 8 assorted weapons recovered. Colonel Abdul noted in the statement that since the commencement of the operations, confidence has been restored to the locals who have since resumed their normal farming and commercial activities. He said the army and other security agencies and the men of operation Yaki in Kaduna have through various operations been able to reduce and subdue activities of bandits and insurgents. @ pretty joyce must u comment? stop asking silly questions.